Walking seems like such a basic thing to do. In a lot of cases when we walk our horse we aren't really paying much attention to how we ride. Were just walking. It could be on a trail with a group of friends where everyone is talking and walking at the same time. Well, did you know that there are 3 different speeds of the walk? Its true and even humans have 3 speeds. There the fast walk, which is self explanatory as being the fastest pace of your horses walk. 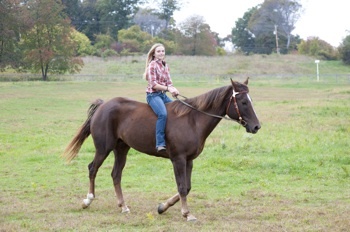 There is the normal walk which is how your horse would walk if you are seated in your regular position in the saddle and your horse is just walking with out any influence to go faster or slower. Lastly there is the slow walk. The slow walk is when you are applying just enough pressure to the bit that your horse is taking very slow steps. There should always be slight contact with the bit at each stage of walking, but not enough to make the horses mouth in comfortable. When I say contact I mean the reins are not giving a lot of slack. They are collected enough so if you would need to stop or slow down your horse you would just have to shift your body weight back bringing your hands with you. Never yank or jerk the horses mouth with the reins. Just remember that the horse reflects the handler . The "walking game" is where you have your horse walk circles or walk along the fence of a ring or field. When you walk you pick a different speed. Have your horse walk that speed the whole way around the ring once or twice depending on if they do not break the speed. 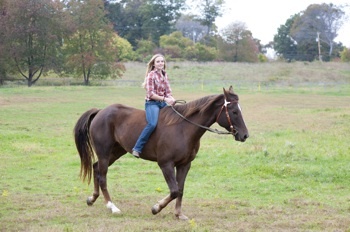 Switch up the speeds and when you horse gets the hang of it you can walk a few steps then switch and have fun with it! Try and keep you horse flexing the whole time. Flexing is when the horse has a nice arch in there neck from keeping there nose down. Also, remember to go both directions! Stop your horse every once in a while and back him up, then let him stand there for a minute or two so he can relax. Notice in these two pictures that I am applying very light contact as I walk. It helps keep the horses attention on you without causing uncomfortable pressure on the horses mouth.